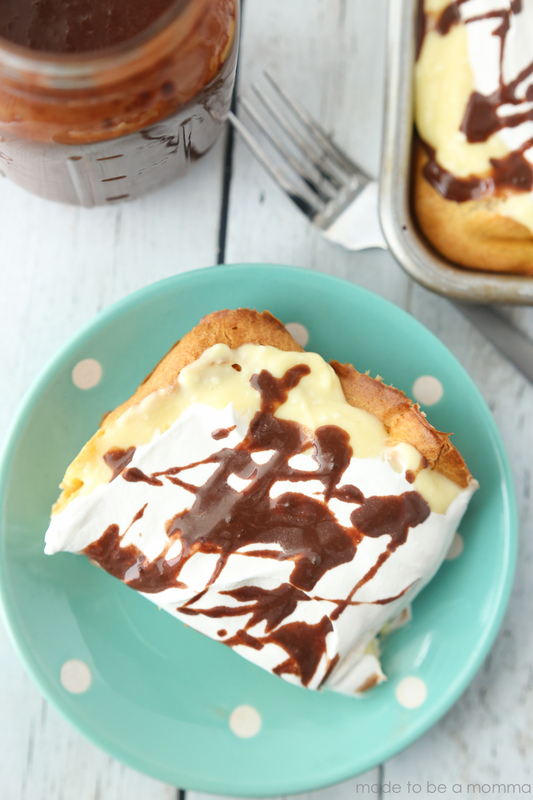 This Eclair Cake is the perfect crowd dessert. Top it with a delicious homemade chocolate sauce and your guests will be begging you for the recipe! You will need to melt your butter and water together, make sure it is rapidly bowling before you remove from the heat. Remove boiling butter mixture and pour a small amount in a medium size bowl. With a hand mixture mix in some of your flour and beat in eggs one at a time. You want the batter to be smooth. 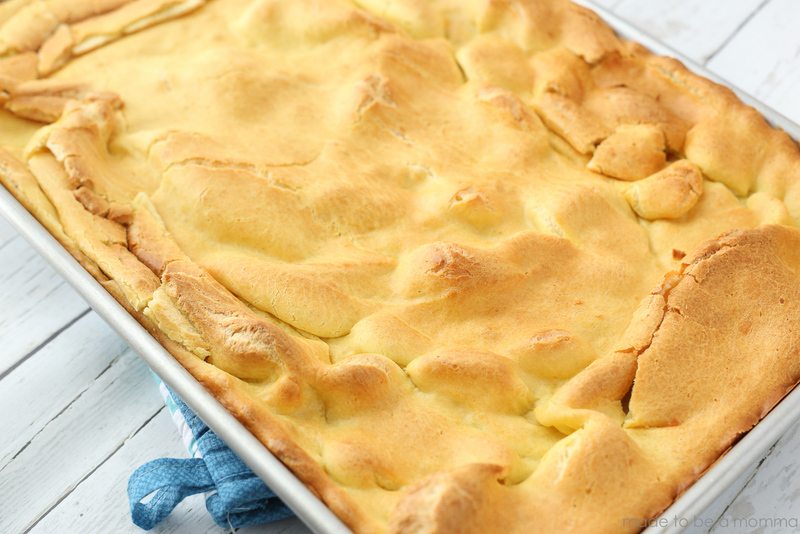 Grease your baking pan before adding the batter to be sure it slides of easily when finished baking. Don’t have time to make our homemade chocolate sauce? Any one of your favorite store bought chocolate sauces will work just fine! When it’s baking, the eggs in the mixture makes the crust become a beautiful golden brown with the perfect amount of fluff. After it’s baking you may have a few air holes or places where the crust is very lumpy, while the crust is warm just push them down 🙂 It’s okay if they break a little bit. It’s a crust that is perfectly imperfect. 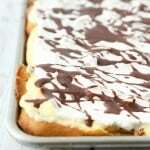 You will then top the crust with vanilla pudding, homemade or store bought and then add a layer of whipped topping. 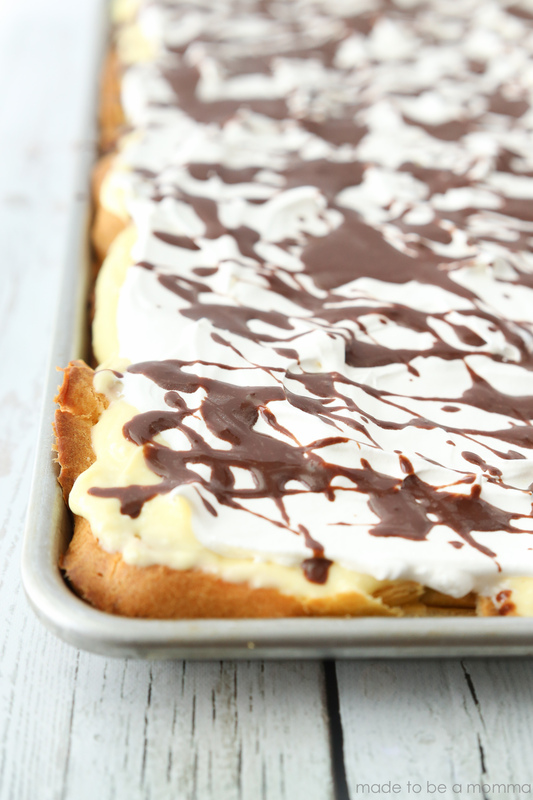 It’s all about the layers with this delicious dessert. To really dress up the dessert we love to add a pretty drizzle of chocolate sauce on the top. It adds a decadent look and the semi-sweet chocolate helps break up the vanilla taste. Boil water and butter together (must be rapidly boiling) Remove from heat. Bake at 400 degrees until light golden brown, approximately 20 minutes in a 17 1/2 x 11 inch pan or 30 minutes in an 8 x 11 inch pan. Prepare pudding by adding milk. 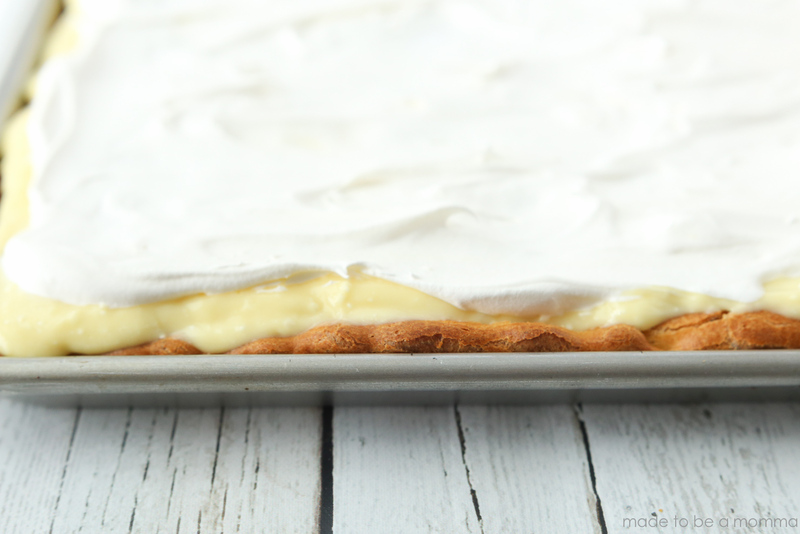 Whip in cream cheese, Spread over cooled, puffed layer. 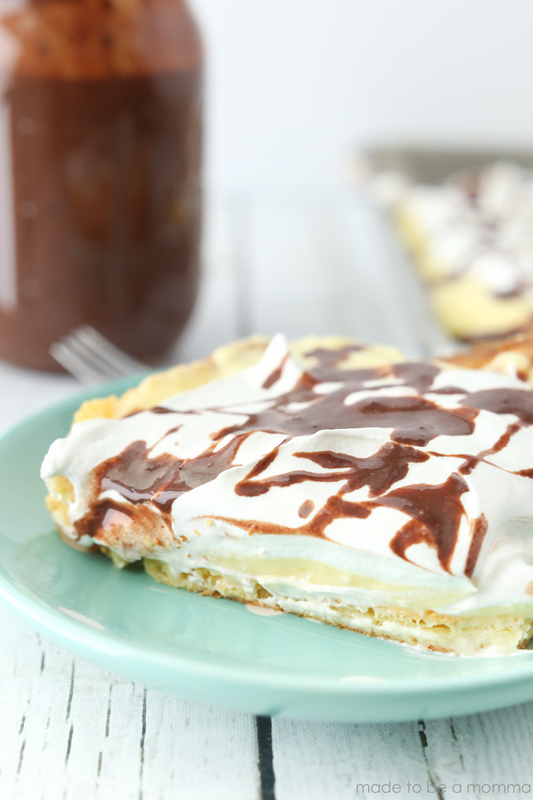 Top with Cool Whip and drizzle with chocolate sauce. Refrigerate for 2-4 hours before serving. Would melted chocolate work instead of chocolate syrup? I spread crust dough in an oval. bake. Once cooled, cut crust length wise, (so you have top/bottom). Then folded cool whip into pudding mixture. Spread mixture on bottom half of crust, set top half on top, then drizzled choc syrup. Your own cake size eaclair! Yes of course! Butter is better especially when preparing a basic cream puff mixture! Would you give the recommended number of reasonable-sized servings for this, please?